Biology is truly the science of the future where today’s students will work in areas that do not yet exist. And, at the same time, an abundance of existing career paths offer rich opportunities. Many of our students arrive interested in medicine and expand their horizons to include a range of related fields of human or animal health, such as genetic counseling, clinical lab science, public health, bioinformatics or systems biology. The College of Biological Sciences, one of the top sources of biology graduates in the nation, offers students a wide range of study options within the life sciences. There are nine major programs for the Bachelor of Science degree, an additional four programs leading to a Bachelor of Arts degree and a cross-college Bachelor of Science major. With a wide range of career opportunities, students in the College of Biological Sciences are encouraged to consider research careers, postgraduate programs, professional schools or work in industry, as well as pursue science writing or environmental law, to name just a few examples. Faculty in the college are distributed among five departments: Evolution and Ecology, Microbiology and Molecular Genetics, Molecular and Cellular Biology; Neurobiology, Physiology and Behavior; and Plant Biology. Each department hosts at least one major, but some host several. Our college also offers a cross-departmental major, and one track with the relatively new cross-college marine and coastal sciences major. You'll join your fellow biological science students in the same core of foundational classes. This material gives you a strong base in biology, chemistry, mathematics and physics at the lower division, and is followed by more advanced studies in genetics, biochemistry and cell biology at the upper division. 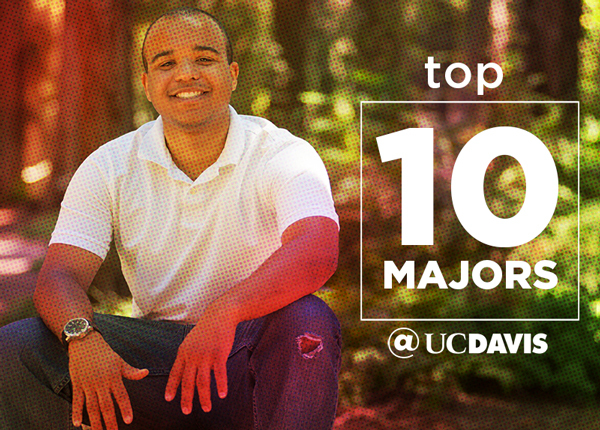 Students then specialize by taking depth material within their major. Because the first two years of study are almost identical for all students in the college, students are free to explore their interests in the biological sciences without worrying about whether they have selected the right major. If a student discovers a new passion within biology, changing majors is not difficult. The college encourages students to find and pursue an area of study that interests them deeply. The lower-division biology curriculum includes labs or discussion sections so that students can get a feel for biology early in their studies. Specialty labs are also offered with upper-division work, giving students experience with a range of research techniques. Contributing to science through undergraduate research is one way to explore student interests — in our college, you’ll find one major guarantees a research experience and another requires field work. Biological sciences is a major hosted by faculty from across the college and therefore not associated with a single department. This major was revised in 2015 and offers students an opportunity to select an area of focus for their upper division units. Students may choose a B.S. or an A.B. in this major. Students choosing the A.B. program may select upper division coursework outside of the biological sciences. The evolution, ecology and biodiversity major is hosted by faculty from the Department of Evolution and Ecology. This major educates students on the evolutionary and ecological forces that shape life from single species to communities. The methods of study can be applied to communities ranging from the human microbiome to a tropical ecosystem or a coastal wetland. Both B.S. and A.B. degrees are offered. Three majors are hosted by the Department of Molecular and Cellular Biology: The biochemistry and molecular biology major is the largest, followed by the genetics and genomics major, and the cell biology major. These majors offer only B.S. degrees. The neurobiology, physiology and behavior major is hosted by the Department of Neurobiology, Physiology and Behavior. This very popular major focuses on integration of systems within an organism. The major was recently revised to encompass three tracks. Only a B.S. degree is offered. The Department of Microbiology and Molecular Genetics hosts the microbiology major. Coursework for the major includes hands-on laboratory work that prepares students for careers and for professional schools. Both B.S. and A.B. degrees are offered. The plant biology major is hosted by the Department of Plant Biology. This major guarantees a research experience to its students. Faculty in the major study plant evolution, plant development, genetic engineering, and the use of plants as systems for producing medicines, among many other areas. Both B.S. and A.B. degrees are offered. The newest major available to students within CBS is the marine ecology and organismal biology track of the cross-college coastal and marine sciences major, which requires field work at the Bodega Marine Laboratory on California’s North Coast. Only a B.S. degree is offered. If you can see yourself in any of these programs, I invite you to check out our departmental websites. Keep up with the blog, also, where you’ll get first-hand experiences about each of our majors from student bloggers. To learn more about our college and programs, visit the College of Biological Sciences website and follow us on Facebook and Twitter. Susan Keen is associate dean for undergraduate programs in the College of Biological Sciences. She is also a faculty member in the Department of Evolution and Ecology devoted to developing teaching methods that make lecture and laboratory teaching more effective in very large classes such as introductory biology.